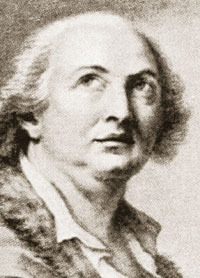 Founder of Egyptian Freemasonry in 1777, the self-styled Alessandro, Comte de Cagliostro had a considerably larger impact on the popular imagination than he had on Freemasonry. His "confession" to the Inquisition regarding the Illuminati was used by both Robison and Barruel in their attacks on Freemasonry. His 1776 initiation into a London lodge attached to the irregular Rite of Strict Observance is undocumented; he may have been initiated in Germany. He is known to have attended the Lodge of Antiquity in London on 1 November 1786. Magician, healer, necromancer and self-proclaimed chief of the Rosicrucians, Cagliostro never admitted to being Giuseppe Balsamo except while questioned by the Inquisition. Arrested in Rome by the Catholic Inquisition on 27 December 1789, he was convicted of forming societies and conventicles of Freemasonry and sentenced to death. This was commuted to perpetual imprisonmentfour years later he died in the dungeons of the castle of St. Leo. Source: AQC Vol. 40 (1927).